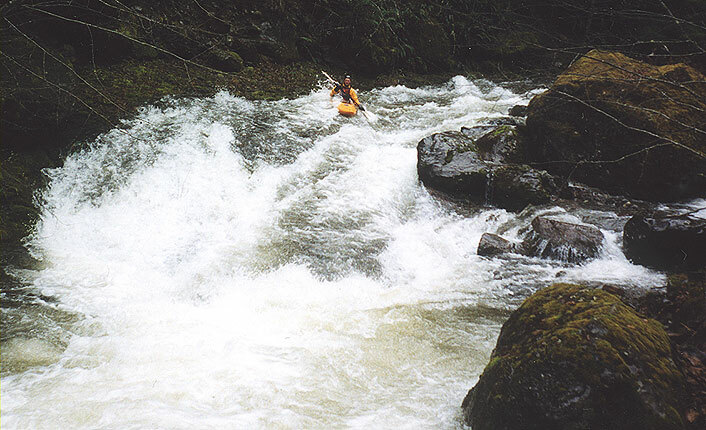 Sardine Creek is one of the best pure steep creeks that Oregon has to offer. This run has it all: Big, technically demanding waterfalls, huge, mind-bendingly steep boulder gardens, and a sky-high 320 fpm average gradient that is guaranteed to keep hard-core steep creekers coming back for more. Access is easy, but catching this run with water in it is a considerable challenge. What still amazes me to this day is how long this wonderful little creek languished in obscurity. 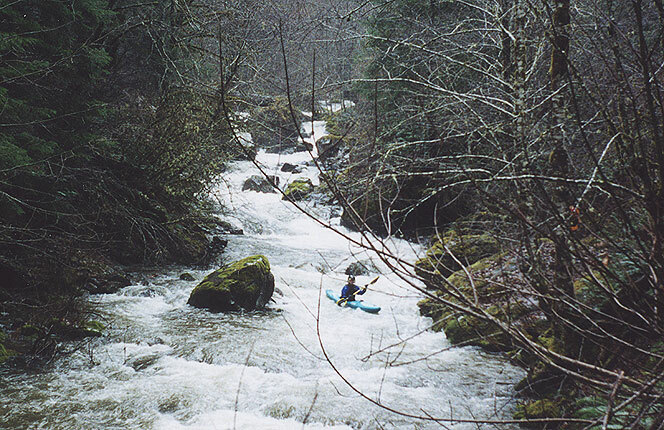 Paddlers have been driving over Sardine on their way to the upper North Santiam drainage for the last thirty years or more, apparently never noticing the gravelly little stream that comes into Detroit Reservior just above the dam. 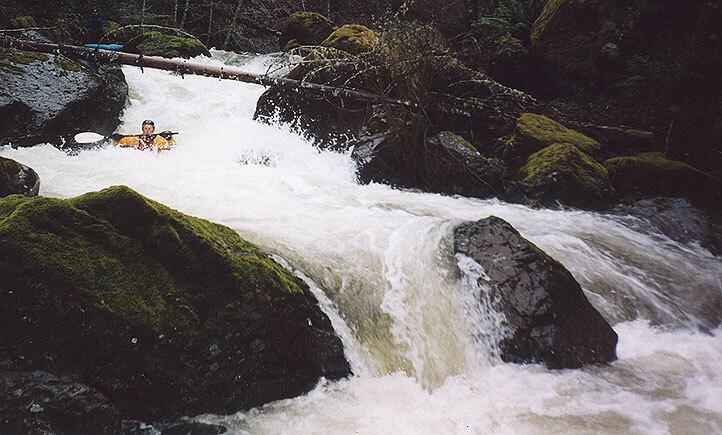 Little did they know that just around the corner and out of sight from the highway lurks one of the most impressive stretches of runnable whitewater this state has to offer. 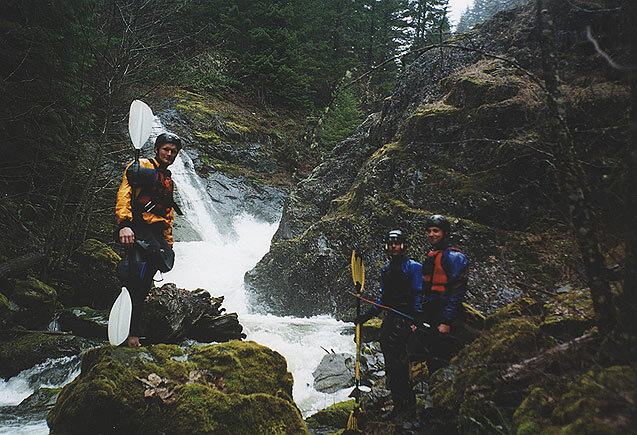 In the fall of 2000 I hiked up Sardine with a saw from the take-out bridge to the source high in the mountains. 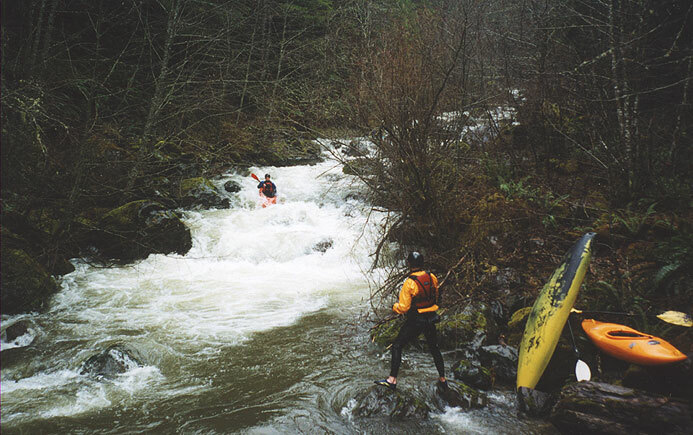 As I worked my way upstream, I was totally blown away by the incredible whitewater potential on this creek. The waterfalls were spectacular, and there were non-stop huge boulder gardens interspersed with lots of ledgy drops. I couldn't wait to run this creek, and it has been on my mind ever since. The geology on this creek is about as good as it gets: Bedrock with boulders piled on top, so when the boulders disappear slides and waterfalls appear. Even though we had run the creek in 2001, it was always at a very low flow. Finally, in January 2003, we had a large rainstorm and we gambled that the water would be up, and we were right. We arrived at the put-in to find about 200 - 250 cfs in the creek, which was about twice what I had seen on previous trips. On this trip I was joined by Jon Fowlkes, Pete Giordano, and Andy Mckinnon. No one had run Sardine but me, and I watched with little surprise as Jon and Andy expressed astonishment at the sheer magnitude of some of the rapids visible from the road. The road itself had been worked on recently, but it was still pretty hard on our vehicles. On both of my previous trips we had broken racks on the way to the put-in, but this time we drove more slowly and made it up to the top unscathed. First we scouted SuperBoof Falls, which had been run in the previous year by the Priestly Brothers. Superboof was still really nasty, with more water going into the undercut, and even though the rocks in the pool on the right were covered they were still very much in play. With that, we opted to put in at the base of Chasm Falls, which had also retained it's unfriendly nature in spite of the higher flows. Putting in at the base of Chasm Falls: From the left, Jon, Pete, and Andy. There is no warm-up on Sardine; the creek drops out of sight below Chasm Falls at an alarming rate! I peeled out and started ripping downstream and was soon out of sight. After about a hundred yards I tore into a tiny one-boat eddy and waited until Jon tore around the corner, paddle churning, and I peeled out and was gone in a second so he would have a place to stop. That's pretty much how the day went. Most of the eddies are barely big enough for one boat, so you have to move downstream in a very aggressive fashion to avoid piling up on each other. 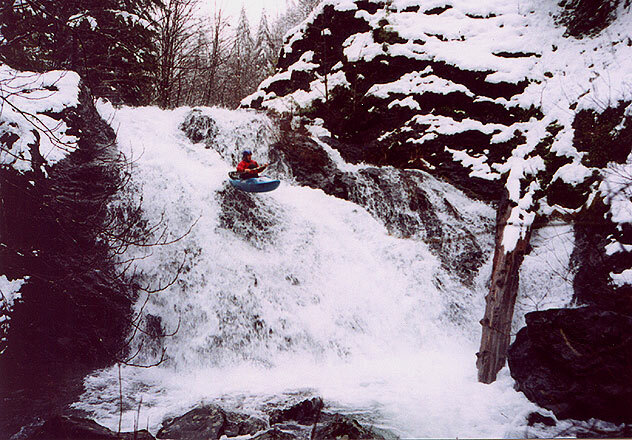 About a quarter mile below Chasm Falls is the final waterfall on Sardine, a fun twelve-foot double drop on a blind corner. There are large logs extending out into the current blocking the view from above, so when you round the corner you have about two paddle strokes to line up before you go over lip... there are no eddies, no stopping... you just have to go for it.. Great fun! Andy runs the double falls on Sardine. Below the Double Falls are a long series of ledges and slides, but soon the boulders start to pile up and the creek starts to drop through a series of wonderfully congested boulder gardens. There are too many rapids to give a coherent blow-by blow description, but soon enough we reached the Impaler, a drop that has pinned at least one paddler previously. 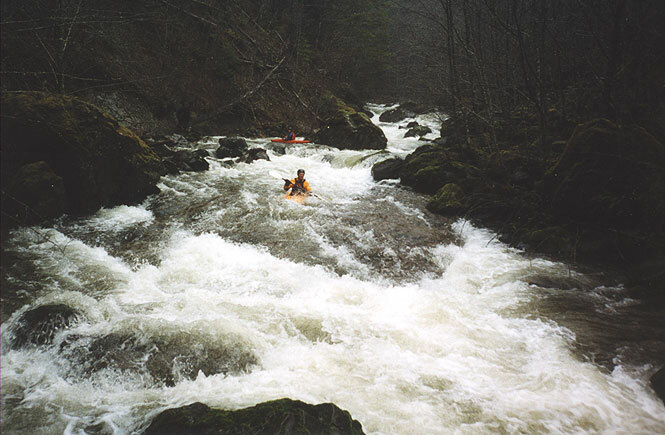 The Impaler has two parts; at the top the creek splits around an island and then converges where a side stream is adding to the flow with a quick move around a couple of large boulders and a free-wheeling boof on the left. Jon, halfway down the Impaler, lining up on the crux move. Jon nails the crux move in the Impaler. Note the water piling up on the large, sharp, partially submerged rock to his left. A missed line here could result in a very dangerous pin. 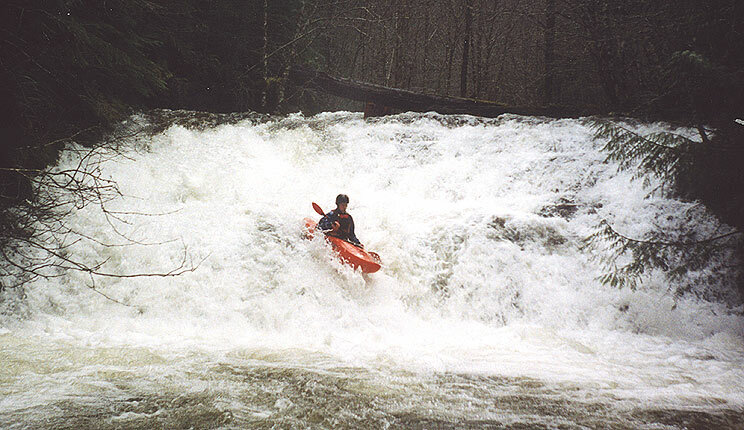 NOTE: A good paddler almost lost his life in the drop pictured here in 2003. Approach with caution, and always set safety on this drop. Below the Impaler is a long, narrow boulder garden leading to a small, moving eddy above the rapid known as 'Broken Brain' after Gabe Flock re-arranged a couple of the larger boulders with his head on the first descent..
Now THIS is steep creekin'... Andy finishes the long boulder garden leading into Broken Brain as Jon waits with a rope. Pete disappears into a hole at the bottom of Broken Brain while Jon waits upstream..
Jon runs the fun slide below Broken Brain..
Once below Broken Brain there are about a quarter mile of steep, bouldery drops ending with the first large rapid visible from the road. This drop is known as 'Claustrophobia' and consists of a very narrow ten-foot falls on the right that plunges into a tiny pool, or a tight, high-velocity chute on the left. Only Gabe Flock has run the falls, which requires a committing pencil-in move to avoid a face-plant on the boulder in the landing zone. None of us wanted to give the falls a go, so we all opted for the wild ride down the chute on the left..
Pete below Claustrophobia, the last large rapid on Sardine before the take-out bridge. "So this is how I get a rapid named after me." 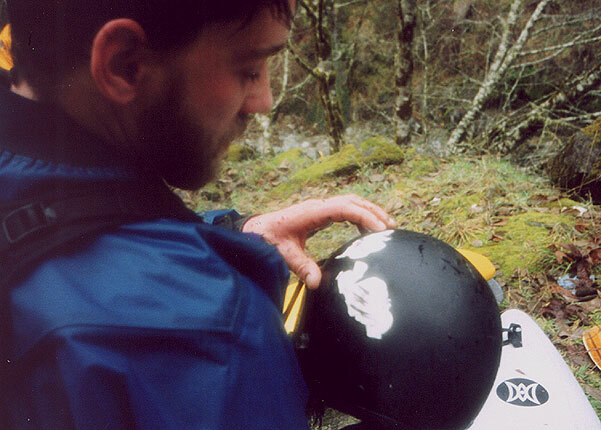 Gabe Flock examines the impressive gouges in his helmet after flipping in Broken Brain while doing the first known descent of Sardine Creek. Sardine has a tiny drainage and only runs after a large rainstorm. Flows are usually about 10% of the Breitenbush river internet gauge. A good first-time flow for Sardine is about 2500 on the Breitenbush Gauge, but I don't think the creek would get noticably harder up to about 3500. 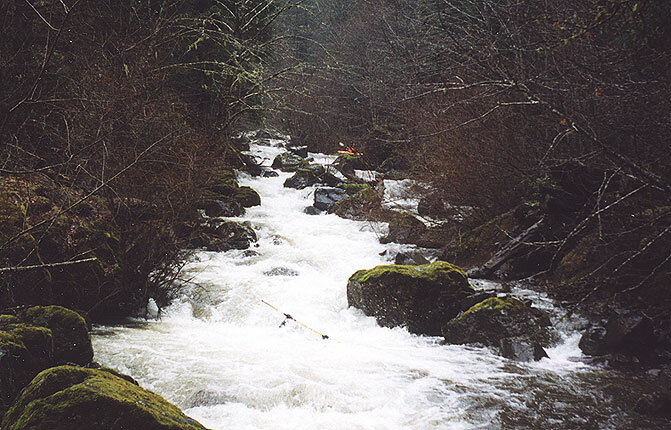 Low water runs on Sardine are not very fun; in fact, this creek should not be paddled at low flows. The boulder gardens are so steep that pins are inevitable at low water, so I would say 2000 cfs and rising fast on the Breitenbush gauge is the bare minimum for this run. The image below shows the flows on the Breitenbush with the day we were on the creek (and when these photos were taken) highlighted in yellow. HAZARDS: The creek from Chasm Falls down to the bridge has historically been entirely free of dangerous wood, so no worries there. Be careful where you put in; there is a 30-foot plunge falls about two tenths of a mile above Chasm Falls that has a shallow landing, and just downstream from there is the V+ drop known as SuperBoof Falls. Superboof has been run but the line is terribly thin; if you miss you will get mangled. If you put in above Chasm be sure you scout the take-out eddies first; Chasm is also V+ or VI, has yet to be run, and is on a blind right corner with few places to stop. When you are driving up the road you will see the double falls, then the road goes up very steeply for about a quarter mile. When it flattens out again, you are at Chasm Falls. Superboof is about 300 yards upstream, and if you continue up the road swings away from the creek at the 30 foot unrunnable falls. The Impaler is easy to find. Look for a tiny side-creek running through a culvert under the road on the drive up. When you see this creek pull off and hike down to Sardine on the left. You can see the horizon line downstream that contains the pin rock from here, and the eddy situation above it.